Special Qualifications: WD form - See below for details. Required Form: Release or Discharge form such as: WD AGO 53, WD AGO 55, WD AGO 53-55, NAVPERS 553, NAVMC 78PD, NAVCG 553 (note: this is not an exhaustive list) showing Pearl Harbor Survivor. 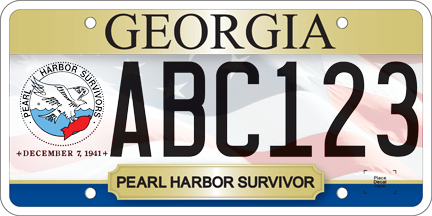 Surviving spouses may request/retain the license plate as long as they do not re-marry. WD form or similar release or discharge form, Death Certificate, and Marriage License required.